Relax in front of a warm, cozy fireplace in this elegant 3 bedroom, 2.5 bath, 1.5 story home with 9' ceilings. This home offers a charming kitchen with a built in island, garbage disposal, range and dishwasher. Appliances are stainless steel. Master suite boasts a large bedroom, walk in closet and vanity with dual sinks. Blown in insulation throughout the home plus garage. With 1700 square feet of living space and 2 car attached garage you will love calling this HOME! Direction: Take martha Layne Collins Parkway to Exit 59B. Go north on Hwy 127. Take a right on Carlton Lane, then left on Valhalla. 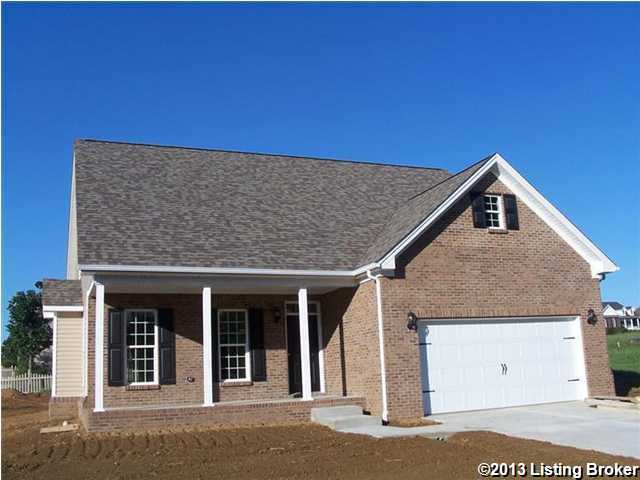 Champions Landing is a subdivision within the city of Lawrenceburg, Kentucky. There are currently 1 Homes for Sale within Champions Landing, with asking prices ranging from $198,900 to $198,900. The average list price per square foot of the available inventory in Champions Landing is $137, which is below the Lawrenceburg average of $139. The Average Sales price of all sold real estate in this subdivision for the past year is $189,450. Recent comparable homes have been selling for 98.77% of their asking price. Waterfront homes represent 0.00% of the available Champions Landing inventory. The population of Lawrenceburg, according to the 2010 Census, is 10,505. The total number of households in the zip code of Champions Landing is 8,251, with an average household size for of 2.55 people. The total number of renter households within the zip code of 40342 is 2,052, which means that 75.13% of households in this zipcode are owner occupant households. 1037 Valhalla Dr, Lawrenceburg KY 40342 is a Home, with 3 bedrooms which is recently sold, it has 1,700 sqft, 0 sized lot, and 2 Car Garage parking. A comparable Other, has bedrooms and 0 baths, it was built in and is located at and for sale by its owner at $ 0. This home is located in the city of , in zip code , this County Other, it is in the Subdivision, and Woodland Park are nearby neighborhoods.